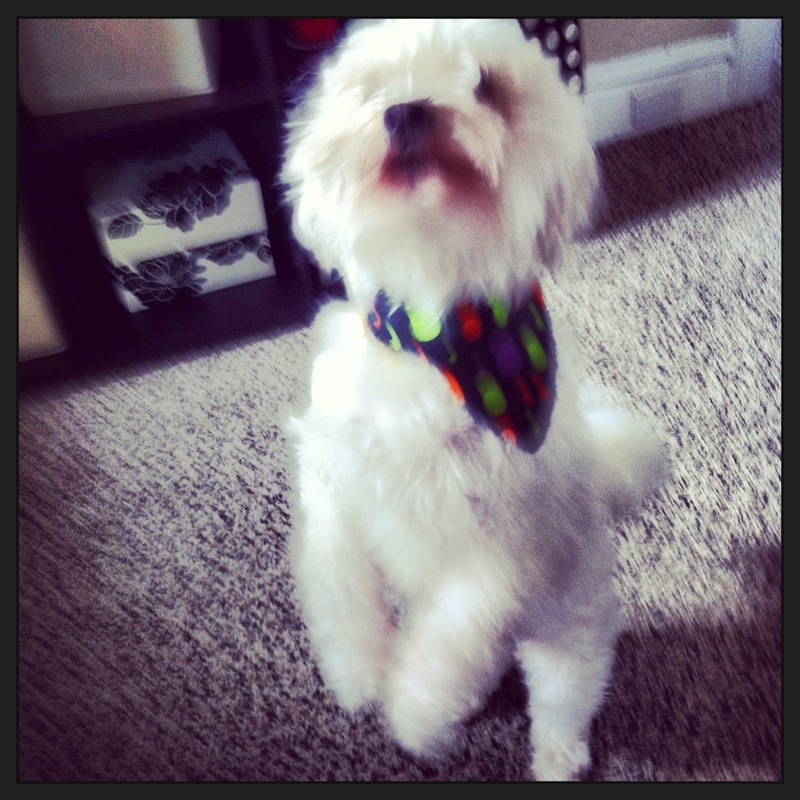 This post is about dog training; more specifically, training Indie to STOP BEGGING! Aside from whininess or hyperactive-ness, begging is my least favorite thing dogs do. Whining and being hyperactive is more of a breed personality trait, however you give a dog human food, no matter what breed they are, they’re going to start begging. When I first got Indie, I didn’t feed her scraps and she didn’t beg. Then, I moved into a house with two roommates and one other who technically didn’t live there but thought it was okay to feed my dog anything they were eating, and by anything, I mean I once caught them giving my dog half of a McDonald’s cheeseburger. Needless to say, once Indie was out of that situation, it was a very, very hard habit to break. She’s been beg-free until my daughter starting eating “normal” food in her high chair. At that point, Indie pretty much became a vacuum for our dining room. Then, she started getting in the way any time there was any food out in any room in the house–I can’t tell you how many times I almost fell over her in the kitchen. After that, it got to the point where literally the only thing Indie cared about or got off her dog bed for was to either stare at us while we ate or scavenger the floors for food like some starving homeless thing that hadn’t eaten in three days. As you can tell, it got more than ridiculous and annoying, and all the things I’d done before when I didn’t have to worry about there being food on the floor all the time were no longer breaking Indie’s habit. So, I did some training research. These are the 5 most helpful tips I found and am doing currently. 1. Do not acknowledge your dog in anyway while you’re eating or have food out. It doesn’t matter if they’re jumping up and down or in your face whining, don’t say ‘no’, don’t command them to go away or do anything and don’t even talk about them. Literally act like they’re not even there. 2. Make the rooms where you eat or prepare food off limits to your dog (kitchen, dining room). If there’s a separate place for you and your “human” food and a separate place for your dog and their dog food, it cuts out the confusion and temptation completely. It may seem like a difficult thing to stop a dog from going into a room, but when you set a boundary and make it known that it’s not okay for them to go past it, it’s amazing how quick they pick up on it. 3. Do not ever feed your dog any human food. Ever. Or you’ll be back at square one every time. 4. Be firm and consistent. Dogs are like kids in that they will try to push their boundaries, and if you let them get away with something every once in a while, they will continue to try every time. 5. Make sure your dog isn’t scarfing their own food down. So, make them take breaks while they eat or put their bowl at chin level so they can’t eat as fast. If you’re able to, it may even help to feed them more often throughout the day, so instead of 1/2 a cup twice a day, try 1/3 a cup three times a day, along with keeping their feeding schedule consistent. I found the majority of my advice here and here. Some of it goes into a little more detail on the tips above as well. Overall, these tips have worked really well. It’s taken a couple weeks, but Indie’s pretty much back to the point where she doesn’t beg anymore. There’s been a couple issues with her trying to sneak into the dining room and vacuum up the floor, but I’m always consistent, I tell her no, and she gets in trouble each time. It seemed like the minute I decided she was no longer allowed in the kitchen or dining room, she knew. I was taken aback by how fast she realized she could no longer go into those rooms; it was almost immediate. All of it has been fairly easy, and it’s nice not to feel like my only interaction with Indie is snapping at her for begging. So, if you have the annoying begging problem, I’d suggest trying these tips. Obviously, everyone in the household needs to be on board because if anyone’s undermining what you’re trying to do, the dog’s behavior isn’t going to change. Everything I’ve read also says this is something that needs to be consistent, and you can’t put a time limit on it. Some dogs take a week, others take a month or more. Regardless, it’s definitely worth it though. Let me know what your biggest problem is with your pet and what training tips you have for it! Interesting! I didn’t know a lot of that. My dog isn’t an issue, but when I’m at my parents house, the dogs know that they are not allowed in the dining room when we are eating dinner. My mom tells them I’m being mean, but dinner is so much better without them sniffing and putting their noses ON THE TABLE!! I’m glad that you’ve been consistent and that it is working! Thanks! I’ve been pretty lucky in that Indie is a good dog 99.9% of the time. A lot of people think the same of me when I won’t let them feed her scraps or let her in the dining room, but so many people just don’t understand that consistency is the key to a well-behaved dog! What kind of dog do you have? I have an amazing chihuahua. He’s a lover! My parents inherited my brothers boxer (he passed away a few months ago) and the poor dog is lacking in manners! They also have a German short haired pointer, and a bichon/Pomeranian mix who wakes up in a new world every day (I have no clue how to spell that!!) So their dogs require more consistency than they get… Except when I’m around! I love the diversity in breeds within the family! I have a couple friends with chihuahuas, and they absolutely love them. I have one friend with a boxer, and she’s so sweet but definitely has a ton of energy! Bichons are one of my favorites; I’ve never seen that mix. Sounds fun! All in all they are all awesome! Some just have better manners! Lol.